Assistance League founder, Anne Banning, always felt that it was fine to serve youth, but better to let youth serve. So in the 1930’s she called on the daughters and granddaughters of Assistance League members to assist in various philanthropic programs. We are proud to continue to encourage and provide volunteer opportunities for today’s youth. The aims of participation are to develop a sense of community responsibility, self-reliance, personal responsibility, poise, public speaking and leadership skills. 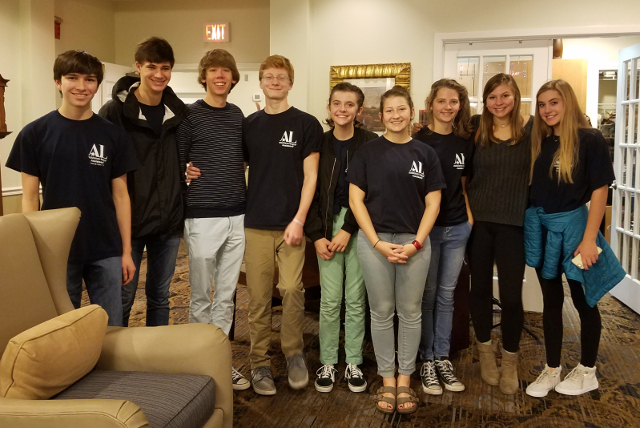 One of thirty-nine auxiliaries nationwide, Assisteens Auxiliary of Assistance League of Houston, was established in February 2002 to provide opportunities for our youth to volunteer their time and talents in the greater Houston area. In addition to participating in Assistance League Programs such as our Thrift Shop, and Operation School Bell® , the Assisteens seek out opportunities to serve the community in other forms. A group favorite is the Christmas visit to the Gardens of Bellaire, where they decorate walkers and wheelchairs and spend time with the residents. Birthday in a Bag – Assisteens fill bags with traditional items needed for a birthday party (cake mix, frosting, candles, plates, napkins, etc.). The bags are distributed by counselors at a nearby elementary school to children who would be unable to have the items for a birthday party. Blankets – The Assisteens hand tie blankets and donate to the nearby Houston Women’s Center. 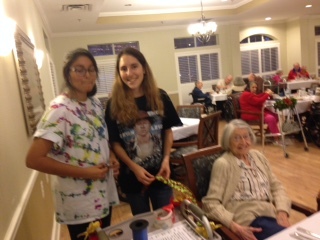 Senior Partners– Spending time with the residents of Gardens of Bellaire assisted living center and decorating their wheelchairs, walkers and canes for the holidays. Membership in Assisteens Auxiliary is open to high school students in 9th through 12th grades. Annual membership dues are $45. Click here to download the membership application, waiver and treat, and photo release forms. Meetings are held August through April. The business meeting, conducted according to parliamentary procedure, is followed by philanthropic program work. Programs vary each year and are voted on by the membership. 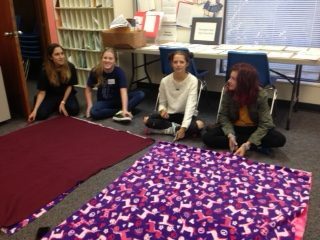 For additional information you may email adminassist@assistanceleaugehou.org or call 713-526-7983, Monday-Friday, 9:00 a.m. – 4:00 p.m.
Assisteens at Assistance League Houston’s Chapterhouse preparing Blankets for the Women’s Shelter. 2018-19 Calendar will be updated after the first Assisteens Meeting of the year. The Assisteens are Working on Projects!